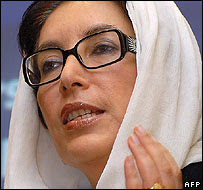 Ms Bhutto had just addressed an election rally in Rawalpindi when she was shot in the neck by a gunman who then reportedly set off a bomb. Is West Behind Musharraf's Move?" Oh no! Not yet another political murder! Apart from the sadness they bring to the loved ones of the victims, they do bring about so much more violence in turn and cause so much and hard to resolve polarization. I read of her death about an hour ago, and also posted about it, on Pot-Pourri. It's a very sad day for Pakistan. She was a remarkable woman, so brave, despite knowing the severe peril she was in. I despise fanatics of all kinds. I hope her colleagues are brave enough to continue her fight. Otherwise, the fanatics will have won. May women rise to honour her life. Yes, Anndi, she deserves honor for what she tried to do in Pakistan. Thanks for commenting. Thanks a lot, Siani, for your thoughtful comments. I agree with what you say. She is a great loss! Yes, Jos, it's a terrible thing! 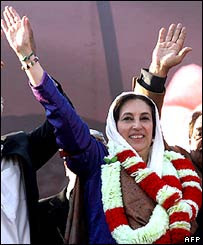 She was probably going to win the next elections in Pakistan and bring democracy to that politically violent country.